Minister of Energy Berat Albayrak, who is also President Recep Tayyip Erdoğan’s son-in-law, on Sunday shared a photo on his Twitter account saying that he had given the necessary warnings to bureaucrats about continuing power cuts across the country. 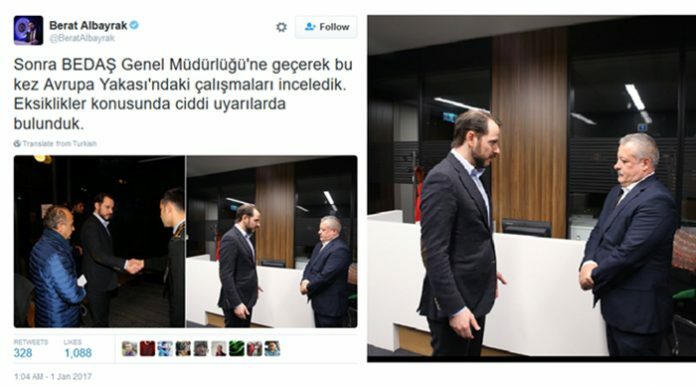 In the tweet Albayrak said that “we issued serious warnings about the situation,” adding a photo in an effort to increase his credibility. Albayrak displaying such a photo led to him being mocked on social media by people who criticize nepotism in Turkey. Previously, there had been rumors that President Erdoğan beats ministers when he gets angry, but the stories have never been confirmed or denied. Electricity blackouts were still ongoing in İstanbul on Jan. 2, as officials say Turkey’s largest city and nearby provinces will continue to suffer from power outages on Jan. 3. People on social media, especially parents, protested the electricity cuts since children are unable to study and are suffering from cold weather as heating systems are also affected by the blackouts. The Organized Industrial Zone in the Marmara province of Kocaeli was also affected by power outages. Power cuts disrupted water distribution systems elsewhere in the Marmara region, with unplanned and sudden power outages reportedly damaging water pumps. Albayrak turned out to be the center of debate after his personal emails were shared by Wikileaks last month, revealing that Albayrak did not write his Ph.D. dissertation, but that a professor named Erişah Arıcan did. In April 2016 Professor Erişah was also elected to the board of Borsa Istanbul, Turkey’s stock exchange.